Alison runs a drop-in creative writing group at Babington House near Mells, Somerset on Wednesday mornings 10am – 12. This is for members of Babington House, guests of the house and Alison's guests. 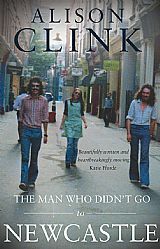 My memoir, The Man Who Didn't Go To Newcastle, is now available from Troubador Publishers. You can buy this book online or order it from any bookshop. Its easy and safe to buy online from this website. We use Paypal as our transaction service and their secure servers handle all the secure information. Your card details are never visible to us. You do not have to have a PayPal account to use the checkout. Click here to listen to Clare Balding discussing The Man Who Didn't Go To Newcastle with the Rev Ruth Scott on her Radio 2 Sunday morning programme on 7th June. The section about my book comes around 47 minutes into the programme.